1. Alias (2001 - 2006) - Agent Sydney Bristow (Jennifer Garner) actually made this show my first and longest-lasting TV show obsession. A friend introduced me to the series while I was in high school, and I believe they were already on the third season at that point in time. I'll tell you what - this show is the ultimate binge-watch because each episode (in the first few seasons) ends on a cliffhanger. You literally can't turn off the TV! And those season finales? HOLY SHOCKERS! I loved so many things about this show - the relationships, the spying, the surprises, the costumes. I think it got a little off track when it focuses on the Rambaldi stuff, but this is still one of my favorites. 2. Felicity (1998 - 2002) - I didn't start watching this show until college, long after it had gone off air. And yes, it's melodramatic and Felicity has her batshit crazy moments. Despite it all, I still loved sitting down and popping in a disc of this show. I was 100% Team Ben! In some ways, Felicity prepared me for love triangles because this show definitely loved the good tug-of-war between these two leading men. 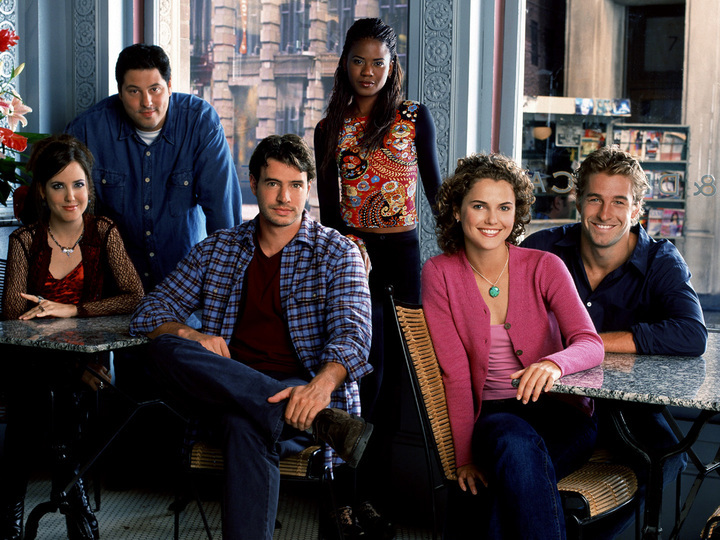 I think part of my love for this show was because I watched Felicity go through college while I was in college. Not because we had similar experiences - just because it adds a touch of nostalgia when I rewatch it now. 3. 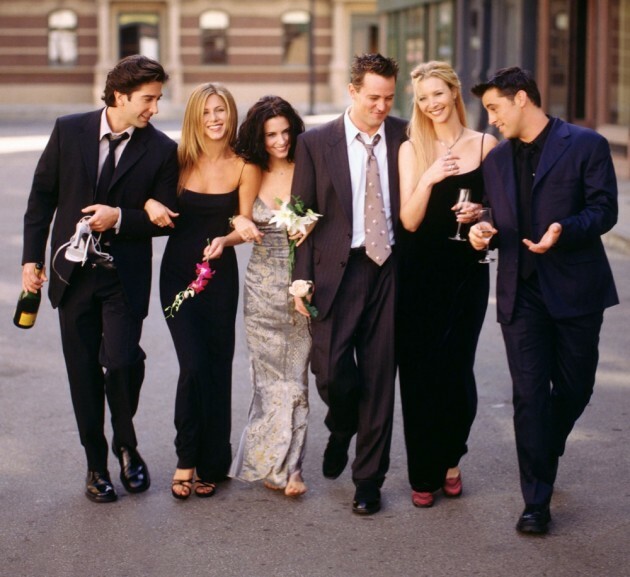 Friends (1994 - 2004) - You're going to judge me when I tell you that I didn't watch Friends until a few years ago. I never watched it while it was on TV because it ended the year I started high school (and I'm pretty sure I and/or my parents considered it too adult at the time). Of course, reruns still played all the time on TV, but I never managed to catch that many until college. After realizing that I was always watching reruns, I scored all 10 seasons for a great deal on eBay. And then proceeded to spend every single day that summer watching Friends. I honestly can't even begin to tell you how much I love this show, so I won't even try. It's definitely a show I return to again and again! 5. 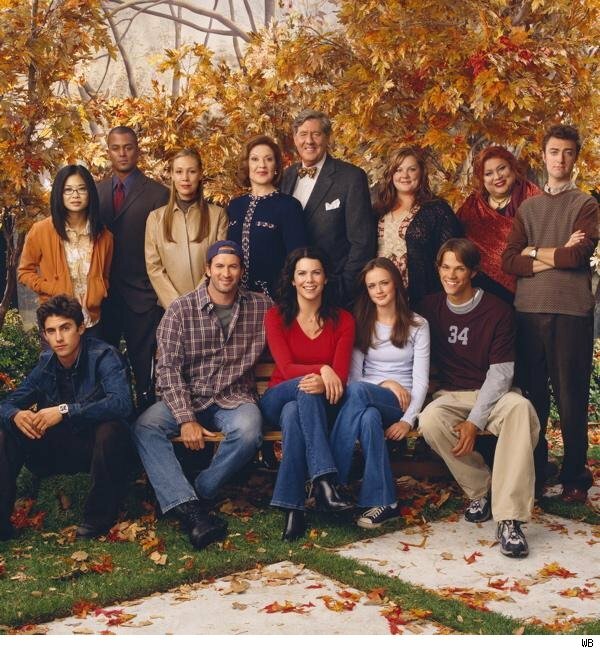 Gilmore Girls (2000 - 2007) - Good ole Stars Hollow! I remember a friend in middle school telling me about this show, but I was so not interested at the time. Fast forward a few years, and I was buying/asking for these every chance I got. From the amazing mother/daughter relationship to the crazy townies, Stars Hollow has perfected the art of zany characters. Throw in a bazillion pop culture references and lots of fast talking, and you've got yourself a winner. This show just had so much heart! 6. Gossip Girl (2007 - 2012) - This show started right when I was beginning college, and I remember thinking it seemed so scandalous. While it's the most completely unbelievable world, I still couldn't help getting addicted. The clothes, the drama, the gossip... I loved tuning in each week and did NOT want to miss it! I was so sad when it went downhill at the end, but I still loyally tuned in and stuck it out. I had to see how it all ended. Now that it's over, I still watch it now and again to see my favorite Upper East Siders making mostly dumb decisions. I just can't help myself! 7. The O.C. (2003 - 2007) - This was on while I was in high school, but I didn't watch it then. This was another binge watch for me while I was in college! I borrowed the first season from a friend, and then I was hooked. I actually remember watching it on my laptop during my Statistics class. Sorry I'm not sorry. Like Gossip Girl, it definitely floundered a bit at times but there was still so much awesome in there, too. Namely, Seth + Summer. 8. Veronica Mars (2004 - 2007) - This was another show that I watched because of Twitter and book bloggers. They've clearly never steered me wrong! Like a modern Nancy Drew (but darker, smarter and funnier), Veronica Mars was such a joy to watch. Is there anything better than a teenage sleuth? The final episode was a heartbreaker - so many loose ends and unresolved feelings. That's why I'm so pumped about the upcoming movie. Gotta love the power of the Internet + fandoms! 9. 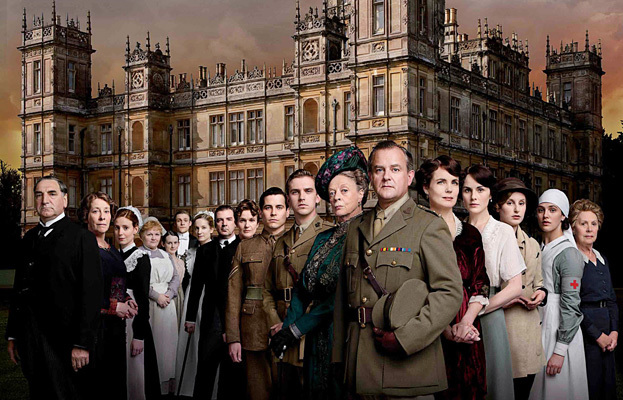 Downton Abbey (2010 - Present) - I remember tuning in to PBS for this first episode of this show and making it about 30 or 40 minutes before I just changed the channel. I love a good costume drama (see also my love for historical fiction), but this one just wasn't holding my attention at first. After the first season ended, I started hearing about this show everywhere I turned. I decided to give it another chance, and now holy cow I love the Granthams! I just there were more episodes each season and that Julian Fellowes would stop tearing my heart into pieces (aka people would stop wanting off the show). 10. Grey's Anatomy (2005 - Present) - Why yes, I am someone that still watches Grey's Anatomy. And I totally discuss it with my coworkers the next day. As with most of the shows I mentioned, I caught up on this one when I was in the fourth season (I think). And it's been a journey ever since. I just can't stop watching this medical drama! While there have been characters and plotlines I found completely ridiculous, I'm still tuning in every week to see the crazy medical cases and the relationship drama. I can't help it - there are all just so damn good looking. 11. Hart of Dixie (2011 - Present) - I originally tuned in because of Rachel Bilson and almost tuned out because it's quite over-the-top and cheesy at times. I feel like the show is finally hitting it's stride, and I just can't quit it. Does it still have it's eye roll moments? Certainly. But I'm still dying to see what happens in Bluebell each week and who Dr. Hart chooses next season. Clearly I'm a sucker for The CW! 12. Nashville (2012 - Present) - After falling love with Connie Britton on Friday Night Lights, I knew I wanted to give this show a try when I saw all the promos for it last year. I love how music is incorporated into the show each week, and I love all the up-and-coming versus established artist drama between Juliette and Rayna. I really loved the first season, and I can't wait to see where it goes next! 13. 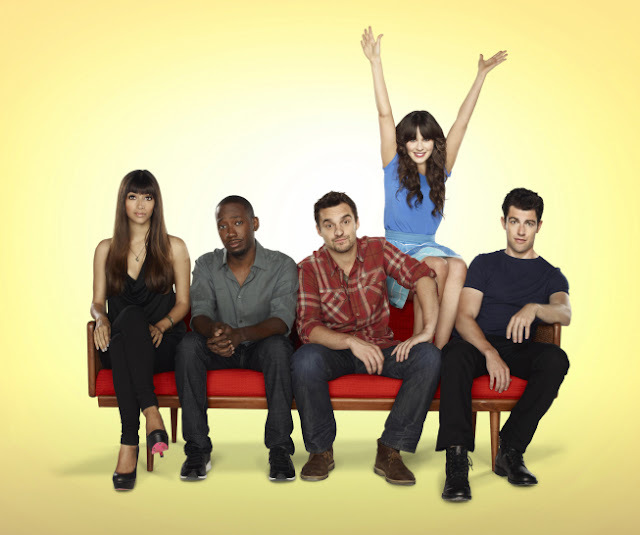 New Girl (2011 - Present) - I can't think of another show that makes me laugh as hard as this one. I come into work every Wednesday dying to talk about the funniest moments from the night before! This is one of the only shows (in addition to Nashville) that I've watched from the moment it aired. I love how each character is getting their time on screen, and Jess is no longer the focus of every episode. I think that's made it a stronger show because I look forward to every story since I truly love every character! 14. The Vampire Diaries (2009 - Present) - Finally, we are ending with my most recent TV obsession. I think I started watching this because I noticed it on Netflix Instant and thought, "Well, why not?" My husband was out of town, and I was bored. That's the perfect recipe for a new TV show addiction. I started out completely in love with Stefan - and completely unable to turn off the damn TV. I kept thinking, "Just... one... more..." Well, four seasons later and I'm still hooked. But I've changed sides. Sorry, Damon has won me over and I'm SO PUMPED about next season. I have no idea why I didn't watch sooner, but I know I'll be obsessively watching every week (and mad that I can't binge watch anymore). Waiting a week for a new episode (and a whole summer for the new season) is going to be a killer! 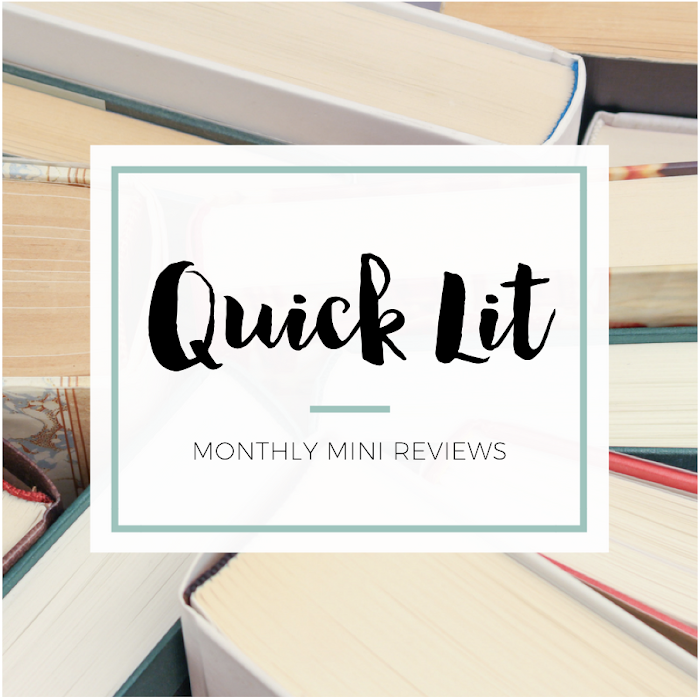 So, now that I've overwhelmed you with my list of favorite TV shows, I'm dying to hear your thoughts! Which shows make your list - and which ones have I left off? Also, comment or tweet me if there's a show I should be watching. I'm clearly all set for a summer binge watch! I desperately miss Pushing Daisies. That show was so great. Oh I've only seen an episode or two of that show! I'll have to look it up. I feel like we need to be friends. All amazing shows. I have watched every episode of Friends, Gilmore Girls, The OC, and Dolton Abbey roo many times I can't even count. Watch one of those shows every night before I go to sleep! I love meeting other Alias fans - and love that you blitzed through the OC, too. Hopefully you can watch all of Felicity one day! Oh I don't even want to talk about the Downton finale - or the other death last season - because I'm still sad. I'll still watch next season but I'm hoping it's not so sad! Great list, I'm a huge fan of tv shows so I love seeing list about them. The OC is my favorite show and I loved all four seasons but I thought the first and fourth were the best and Seth/Summer are my favorite tv couple. I loved Gilmore Girls, Friends and what I've seen of Nashville(I'm on episode 15). I completely loved the first two seasons of Vampire Diaries because it had amazing plots and I loved pretty much all of the characters by the end of the second season. I still loved season 3 but I think the plots started to not really go anywhere and some characters started to becoming unlikable and then season 4 really disappointed me. I really didn't like Damon or Elena as characters this season because they both seemed unbelivably selfish and the plots were rarely paid off in the long run. I do like Damon as a character in general but I hated that he seemed not to care about Stefan's feelings at all and I've always loved Damon/Katherine as a couple since the third episode of the series actually which may sound a but strange. Oh, I totally adore Seth & Summer. They were definitely the best part of The OC for me! And yay for another Gilmore and Nashville fan! I'm sad this season disappointed you! I definitely didn't like certain plot elements (Silas, for example) but I think it helped that I watched all the episodes back-to-back instead of dragged out over a longer period of time. That way it didn't seem to drag too much? But I do hope the storyline gets a little stronger in season 5. We shall see! Too bad you didn't like Damon or Elena this season! I hated no humanity Elena, but I wasn't too bothered by her otherwise. I didn't think they were that selfish/disregarding of Stefan's feelings. But again, that may be because of the way I watched the show (all the seasons in quick succession). Funny that you like Damon and Katherine! I hate Katherine because she's been so horrible to Damon. I could see her more with Stefan (or Elijah - I did like that storyline!). I adore Gilmore Girls. I own all the seasons on DVD and watch them constantly - much to my husband's dismay. I also still watch Grey's Anatomy, but I'm currently behind! I'm going to catch up when the newest season is on Netflix. Haha I love re-watching Gilmore Girls! Sometimes I'll see re-runs on TV and get really excited. Yay for another Grey's fan. I still can't believe that show is still on air! Great topic idea and stellar list! I love so many of those shows. Nashville was a great new one. Though I have to say, I started losing interest in Vampire Diaries this season. I haven't watched about half the episodes though I do hear some stuff goes down with Damon so I might need to watch them eventually. Thanks CeCe! 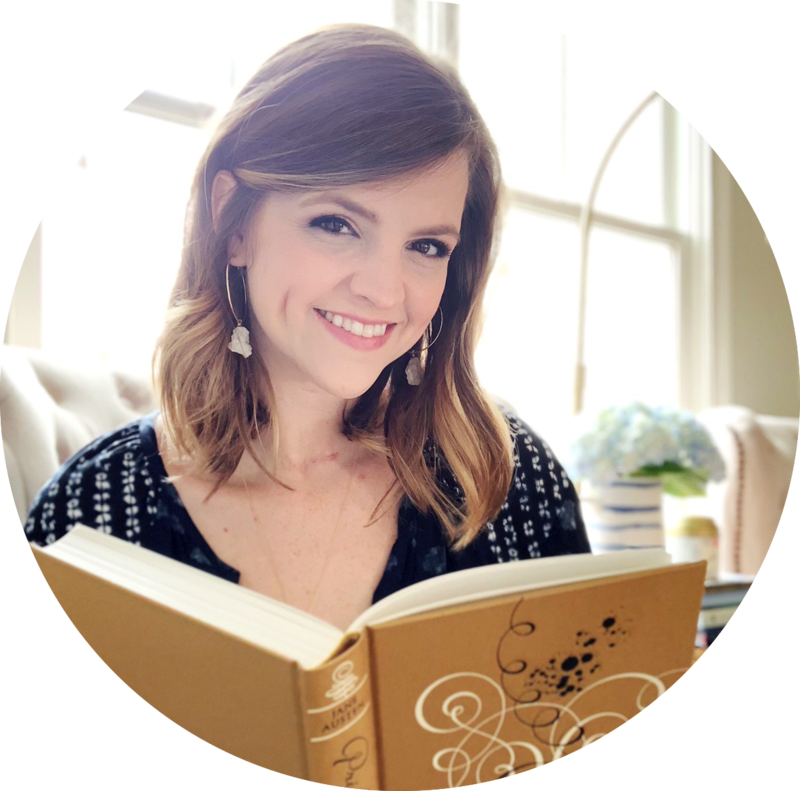 Wasn't feeling bookish when I wrote it so decided to do something different :) Glad you liked Nashville, too. I really got into this year! Since I binge watched Vampire Diaries online (not while airing) I think this season didn't bother me too much. I fell even more in love with Damon during it! Alias is AMAZING! I watched while it was on and was convinced that I wanted to become a spy because of it. I'm still waiting for someone to recruit me. Any day now. . . I too love crazy pants Felicity! There was a summer back in high school where there were re-runs playing every weekday right when I got home from work and I was obsessed! I honestly switched back and forth from Ben and Noel and to this day I still have no clue who I love more. Maybe I should watch it again. Friends is my show! It's kind of sick but I have to watch an episode like everyday. Haha! I totally wanted to be a spy because of it, too. And was always waiting for someone to randomly approach me one day to recruit me! Oh you should re-watch Felicity and see if you love Ben or Noel more now or are still equally torn over the two. Which guy you rooting for on HOD these days? Do you like Nick and Jess together on NG? I am a die hard Veronica Mars fan too. Two fabulous shows! Okay, so I was really disappointed with Wade and probably wouldn't root for him still if this was real life but I totally loved his speech in the finale. I really don't like George - he's so boring haha! And I do like Nick and Jess together, but I'm worried that they'll have lots of drama because there's no way they'll just stay together. Gotta have romantic tension on TV! Ditto to New Girl! It's hilarious! But none of my friends watch it so I'm stuck with no one to talk to. Sigh. Can't wait for next season! Oh man that's lame! I hate when I watch shows no one else does because I love to discuss what's happened each week! 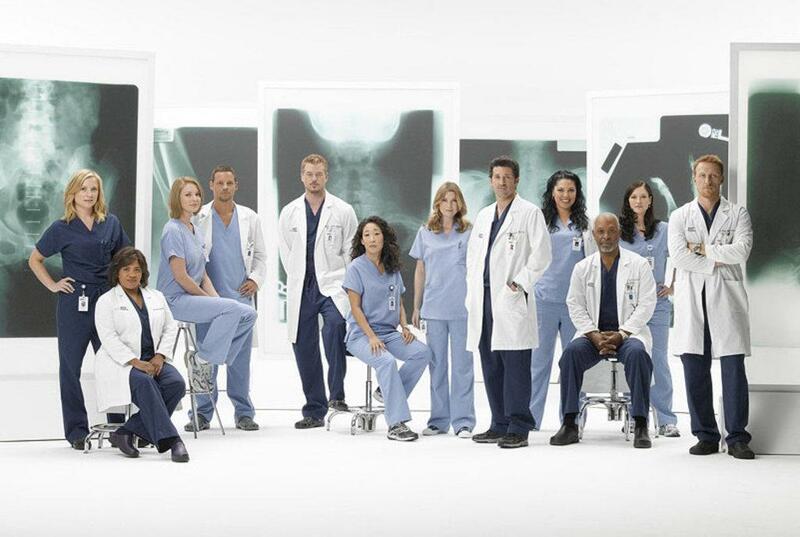 I love Grey's Anatomy too. It's hard to believe that after all these years the writers still come up with good stories but they keep doing it. And Downton Abbey is great! If you ever get a chance to watch the British show "Call The Midwife" I think you might like it. The title makes it sound like a comedy but it's not. It has wonderful characters and very good stories. I get it on the Public Broadcasting Station in my area and season two has just ended, but you can watch it online. This was a great post idea! I know! I can't believe they keep coming up with new storylines for Grey's! I've seen the first season of Call the Midwife but not the second. I really loved it! I need to watch season two but keep waiting for it to show up on Netflix. Oh my gosh, I love your list!! I love TV too. So many of these shows I love. I can remember watching that first season of ALIAS! Thank goodness I was watching via Netflix so I could just watch one after the other. Those cliffhangers! Yay for another TV fan! Oh Alias, that first season just blew me away! I watched on DVD and was SO glad I could race through them. The cliffhangers! Yes, Seth and Summer were definitely the best part of The OC. And I loved Jess, too! Did you know that you just helped me beef up my Netflix queue for shows to watch during my late nights with Lucy? THANK YOU. Liked the list! Some of the ones in beginning went over my head, because I've never heard of them! Big fan of VD and I really like what I've seen of Nashville so far.